My fiancé and I are in Jacksonville to help her sister move into a new house. It is Labor Day weekend. In recent years, I had given up on seeking out adventure on Labor Day weekend in Florida, because it seems as if every place is jammed with people. So I am skeptical that we can find a pleasant place to paddle--particularly near a large metro area. It was with great surprise, then, that the outfitter we rented the kayaks from suggested a paddle at Guana River, which turned out to be solitude for us on this long weekend. Indeed, we paddled for 4 hours in the Guana River Wildlife Management Area (9,815 acres in size) and did not see a single person or boat all day. Instead, we find placid, serene conditions. 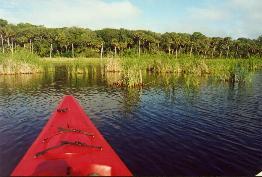 Our paddle brings us upon a large number of ibis, egret, heron and osprey. In fact, on this day we saw a great many osprey flying above us clutching a fish in its talons. Must be easy pickings for birds of prey at Guana River. The management area features shallow water. The motorboat prohibition keeps the area free of noise pollution and slob fishermen. Instead, we find a pristine, little-used setting with a great deal of wildlife activity-particularly wading birds. Near the end of the paddle, we start coming across numerous flying mullet. One of them was such an impressive leaper that she or he leaped right into the tandem kayak I paddled with my fiancé, which elicited a shriek from her. Soon after, we come upon a very rare sight: a flock of white pelicans. 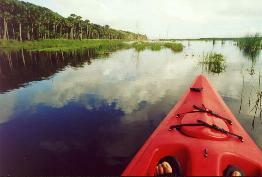 The Guana River is 9 miles long. An account by a Spanish historian in 1592 suggests to contemporary historians that Ponce de Leon's first landing and explorations probably occurred at Guana River. Afterwards, we dine at Neptune Beach. A restaurant called "Ragtime." Top quality seafood. And best of all for a home brewer such as myself, the restaurant brews its own microbeer on site, and provides me with a 9-beer "sampler." Each of their beers were good.